I’d never before bought meatless chicken, so two different kinds ended up in my cart for testing purposes. The clear winner was Gardein’s Crispy Tenders, which are breaded and turn out crispy and sizzling once baked. 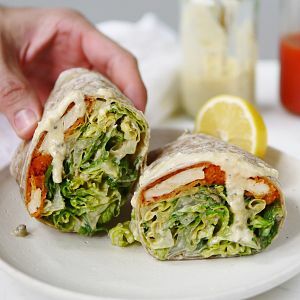 The other kind I tried was Gardein’s Chik’n Strips (minus the teriyaki sauce) — they were okay, but they weren’t breaded and I wasn’t in love with the texture. Enough blabbing, here’s the loose recipe. You can’t go wrong. Enjoy!! Preheat oven to 430F and cook crispy tenders. While tenders cook, make your vegan caesar dressing — you may want to quadruple the recipe, seriously. Chop, wash and dry your romaine, as if you’re making a caesar salad. Place it in a bowl and coat heavily with caesar dressing. When tenders are cooked, place them in a bowl and coat with as much buffalo sauce as you like. Heat wraps so they are more malleable and don’t break while you’re rollin’ (I pop mine in microwave for 15 seconds). 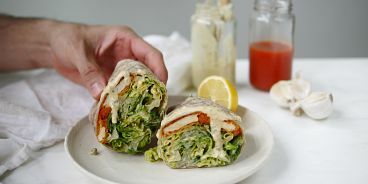 Build your wrap: lay about four saucy tenders in centre of wrap and drizzle with caesar dressing. Now load on the caesar salad and top with a generous sprinkling of vegan parmesan cheese and black pepper.